Instead of grinding the food waste and wasting precious freshwater for flushing, the strainer-drawer in GDRU strains solid particles under the pre-rinse sink when dirty dishes are being pre-rinsed, affecting a much needed pretreatment process of restaurant wastewater. To ensure the food waste is not flushed down your drains, install our Garbage Disposal Replacement Unit to catch any solid waste before it enters the piping system and grease trap/interceptor. (Note that this product is called by various names such as GDRU, Grease Trap Pre-Strainer, Flat Strainer, and Indirect Waste Interceptor.) A GDRU will help to eliminate the backflows and the foul grease trap/interceptor odors, and costly repairs to your pipes. Additionally, many states such as New York and New Jersey have passed laws that require restaurants to install indirect waste units. These products will help ensure your restaurant stays compliant. The unit is 16" long X 11" wide X 8" tall. The legs are 15" long, and are adjustable up to 20". No electricity required. No dangerous moving parts. Easy to maintain. Before ordering, measure clearance from floor to bottom of sink bowl. 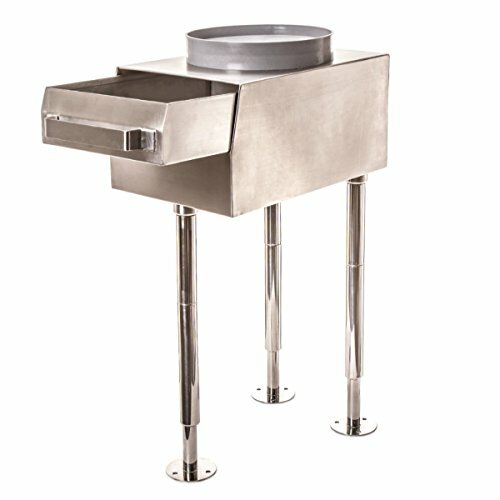 Minimum heigh of unit is 24", Maiximum height is 29"
Rounded crown adaptor on top of unit allows for snug fit under sink bowl. 2" Outlet on bottom of unit for water drainage. If you have any questions about this product by Drain-Net, contact us by completing and submitting the form below. If you are looking for a specif part number, please include it with your message.